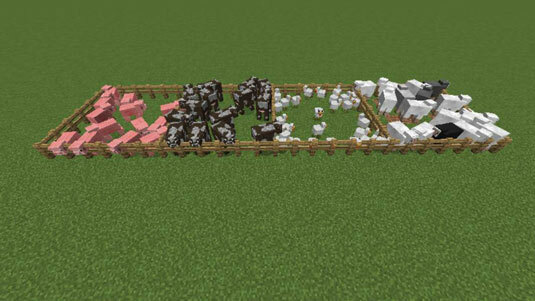 You can use animal farms in Minecraft to acquire resources such as pork or wool without having to endure a lot of hassle. Animals follow you while you’re holding wheat, so lure some into a fenced-in area to start your farm. Chickens are lured by seeds instead. Pigs and rabbits are lured only by carrots. Right-clicking two animals of the same species while holding wheat (use seeds for chickens, and carrots for pigs) causes them to spawn a baby animal. Thus, you can make use of your animal farm however you want and keep it populated. A lamb’s wool is the same color as its parents’ wool. To farm a specific color of wool, right-click some sheep while holding dye to paint them, and then start a farm with them. Sheep regrow shorn wool by eating grass.